In the past I've written about the perils of coveting those wonderful US hop bomb IPAs/DIPAs, only to be disappointed when the product arrives here 3 months old, already on the decline in terms of quality. Since that post around a year ago, we've seen changes in the industry. Changes that perhaps both cement and counter some of the points I made in that previous post. What happens when a top U.S. Craft Brewery teams up with a European counterpart to bring that 3 months down to 10 days, with a product that remains chilled from conditioning tank to tap, arriving here in consistently good condition? It becomes disruptive, that's what. Why? That word: consistency. What happens when a second top US Craft Brewery (partly) crowd-funds* the opening of a European operation ~1/9th of the distance from these shores than their current base with that same buying power and brewing prowess? We'll find out next year but my guess is it'll be equally as disruptive. 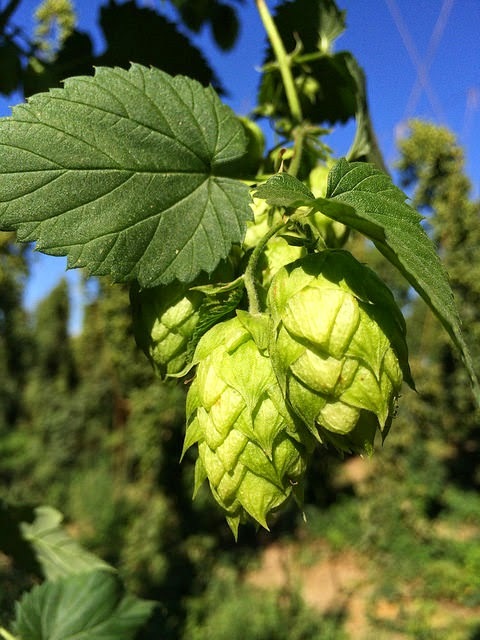 Compared to the likes of Lagunitas and Stone, most UK brewers are probably fighting for scraps when it comes to US hop selection. Fighting not just on volume and variety but far more importantly on quality. Imagine what the brewers in that 'top' list spend on hops each year. Enough to hand-pick their most contracted varieties on a farm by farm basis every harvest? Yes, I'd wager but you can be sure they are at least purchasing at the very top end in terms of quality and at the quantities they need to maintain production. That's what their buying power brings them. That's not to say brewers here can't make superb US hopped IPAs/DIPAs - we've already seen some - just that it's going to be relatively harder to achieve that year round with a consistently good product brewed at a scale to rival what their US counterparts can supply to the UK. That's why Lagunitas are gaining such traction through imports in my view. Their IPA gets here fresh, is consistently good and available all the time, plus at the volumes they're bringing in they can price it competitively. This is not a level playing field. It's an open market and money talks. * A tandleman style footnote here to add that, in my view, the crowd funding had nothing to do with money and everything to do with ensuring that venture will be nothing short of a resounding success in terms of marketing. Well played, Stone. Lagunitas are gaining traction in the UK in a way that others aren't because they can access the distribution network of their parent company Heineken. Makes a massive difference - in the same way as Old Mout or Fosters benefit from Heineken's clout.